These were some of the most important economic reforms the nation had seen in many years. This week in our series, Larry West and Maurice Joyce continue the story of Wilson's administration. LARRY WEST: Most of Woodrow Wilson's political victories were on national issues. He had little experience with international issues. But foreign events soon began to demand more and more of his time. With all of his successes at home, it is a surprising fact of history that his presidency is remembered best for its foreign policy. The story of Woodrow Wilson's foreign policy is full of high ideas and political bravery. But it also is a story of fierce struggle and lost hopes. It is a story that begins across America's southern border--in Mexico. MAURICE JOYCE: At that time, Mexico had been ruled for many years by Porfirio Diaz. As Diaz grew older, his power began to weaken. In nineteen eleven, a revolt broke out. It was led by Francisco Madero, the leader of a land reform movement. Diaz understood he could not win. He resigned and fled the country. Madero declared himself president. However, powerful groups in Mexico opposed him. In a short time, one of his own generals, Victoriano Huerta, arrested him. Madero was murdered soon after Huerta seized power. President Wilson refused to recognize Huerta's government. He believed other forces would rise up against him. Wilson was right. Another revolt began, led by General Venustiano Carranza. LARRY WEST: Wilson offered aid to Carranza. Carranza rejected the offer. He was afraid of American interference in Mexico. He told Wilson that Mexican troops would do all the fighting. He only wanted guns and ammunition. American forces did, however, get involved in the conflict. President Wilson learned that a ship from Germany was bringing supplies to the Huerta government. The ship would land at the Mexican port of Vera Cruz. Wilson ordered the United States Navy to seize and occupy the port. The move started a storm of criticism in the United States and throughout Latin America. MAURICE JOYCE: Many people denounced President Wilson. They called him an imperialist and a fool. They asked: what right did the United States have to interfere in Mexico. Wilson finally stopped American military action in Mexico. He tried to settle the dispute at an international conference at Niagara Falls, Canada. The effort failed. The conference did not produce a settlement. While the diplomats were talking, Carranza's revolutionary forces were fighting. They moved on Mexico City, the capital. President Huerta fled. Carranza formed a new government. LARRY WEST: The new government began to split apart almost immediately. Another general, Francisco "Pancho" Villa, tried to seize power. He forced Carranza out of Mexico City. Then he formed his own government. President Wilson recognized Villa and his government. Carranza, however, refused to give up. Day by day, his army grew stronger. He forced Villa to retreat. 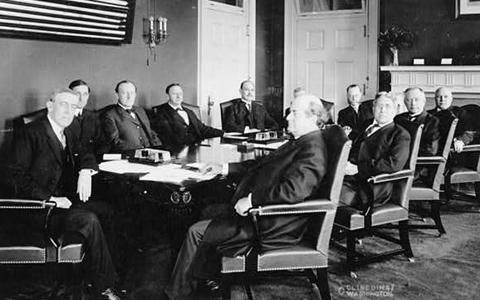 Then President Wilson recognized Carranza's government. Like Carranza, Villa refused to give up. He decided to try to start a war between Mexico and the United States. Pancho Villa wanted the United States to attack Carranza. Then he would step in to lead Mexican forces in battle. That would make him a hero. With this plan in mind, Pancho Villa attacked an American town across the border in Texas. He killed nineteen persons. MAURICE JOYCE: President Wilson immediately ordered a large American force to find and punish Villa. At first, Carranza welcomed the move. Villa was his enemy. He wanted him captured. Then Carranza began to fear that the American troops might threaten his government. He demanded the withdrawal of all American soldiers from Mexico. Tensions increased between the two countries. Villa's forces attacked another town in Texas. President Wilson considered asking Congress to declare war. But the crisis cooled down before then. American forces were withdrawn. And the people of Mexico elected a new government. They chose Carranza as president. LARRY WEST: As President Wilson dealt with the situation in Mexico, trouble began to surface in another part of the world. The crisis was in Europe. Tensions were growing between several groups of nations. They were on the edge of what would become World War One. The major powers in Europe had been threatening each other for years. But they had not fought for more than forty years. Most Americans believed there would never be another European war. Such a war would be unbelievably destructive. Millions would die. No nation would win. MAURICE JOYCE: Europe depended on a balance of power to keep the peace. On one side were the central powers -- Germany, Austria-Hungary, and Italy. On the other side were the members of the triple entente -- Britain, France, and Russia. Each side made every effort to win the support of Europe's smaller nations. A number of nations refused to join either side. The neutrals included Switzerland, Belgium, the Netherlands, and the Scandinavian countries. LARRY WEST: This political balance did not prevent the major nations from competing with each other for colonies and economic power. They competed all over the world. In China, in the Middle East, in Africa -- everywhere money could be invested. Competition was especially sharp in the Balkans. This was the area of Europe between the Adriatic and Black Seas. Many nations claimed special interests in the Balkans. And several Balkan countries were fighting each other. The whole continent seemed ready to explode. MAURICE JOYCE: The spark that set off the explosion came in the city of Sarajevo. The date was June twenty-eighth, nineteen fourteen. Sarajevo had been taken over by Austria. And the Archduke of Austria -- Ferdinand -- had come for a visit. Ferdinand was expected to become the next emperor of Austria. Seven young extremists from the area decided to assassinate the Archduke to protest Austrian control. One of the extremists threw a bomb at the royal family. The bomb missed its target. But another extremist shot at the group. He killed both the Archduke and the Archduke's wife. LARRY WEST: The assassinations in Sarajevo started a series of events that quickly brought war to all of Europe. Soon the continent was covered with armies, battles, and death. The war in Europe forced President Wilson to face the greatest crisis of his presidency.